Lumigon launches high-end T2 HD smartphone | What Hi-Fi? If the flagship smartphones of 2014 haven't caught your imagination – Apple's iPhone 6, Samsung's Galaxy S5 or HTC's One M8 – then allow us to introduce the Lumigon T2 HD. The Copenhagen-based design and development firm has big ambitions with this high-end handset, which goes on worldwide sale from May – starting from €730 (£605). 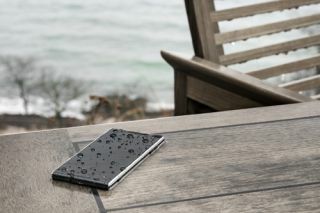 On the outside, the T2 HD smartphone has a "minimalist Scandinavian design, water resistance and solid stainless steel", while innovative features can be found under the cover. They include audio technology from Bang & Olufsen – a subsidiary of B&O that develops and makes Class D audio amplifiers – for "superior sound quality". Hi-fi stereo speakers can be found at the top and bottom of the new smartphone, while there's also a secondary noise-cancellation microphone fitted. Other features include a 13-megapixel Full HD rear-facing camera and a 2.4MP Full HD front-facing camera – the latter sporting FrontFlash technology to allow you make video calls in dark environments. The T2 HD boasts 2GB of RAM and a Qualcomm Snapdragon dual-core processor – and will also offer 32, 64 or 128GB of internal memory, run on Android 4.4 and offer 4G connectivity. The device comes with an exclusively designed dock made from stainless steel, used for charging and transferring data. The Lumigon T2 HD will be available in black, white and limited edition 24-carat gold. Accessories include the dock, two sizes of carrying strap, in-ear hi-fi headphones and a USB cable and charger.